There is a whole lot going on in this book, and it is not a dialogue driven read. There are many chapters with no communication, only inner dialogue. We are quickly wrapped up in Annah's thoughts about her sister, Elias, and all those zombies. Ryan takes her time describing in great detail the dire situation of the Dark City and its flesh eating inhabitants. Annah's struggle to stay alive in a place that is dying slowly every day is described with such veracity that I often wanted to reach out and save Annah myself. Ryan doesn't go lightly on her characters, she makes them suffer. True fans who have read the first two books, don't want to be spoiled....so I won't go any further into the plot. The lasting impression besides "NOOOOOO, I want more," was that this book is dark. Creepy, slimy, gritty, 'never gonna get my nails clean again' type of dirty. This is not a bad thing. We met The Unconsecrated in The Forest of Hands and Teeth, we met the Mudo in The Dead Tossed Waves, and now...we meet the plague rats. In a nutshell folks, we are talking about zombies. Good ole fashion zombies that want to bite and turn you. They are around every corner, and at times I thought that the end of Annah and everyone else was near. There were a few squeamish scenes, but it is all part of the perfect package. Those of you that are looking for a real survival story have found the right book. 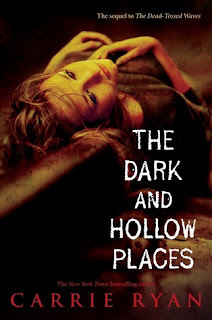 Here are some thoughts from other readers on The Dark and Hollow Banned Book Tour. I encourage you to follow the links and read/comment on their thoughtful reviews. "I, for one, am not a zombie girl, but her writing is just so beautiful and elegant that I don't feel like I am reading about a zombieocalypse." ~Jennifer D.
Thank you Random House for providing the tour book.